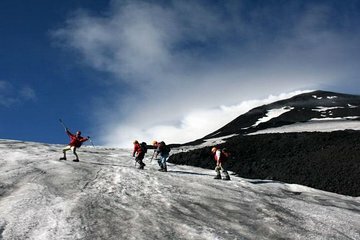 Conquer the summit of Villarrica, one of Chile's most active volcanoes on this guided tour from Pucón. With hassle-free pickup and drop-off from your Pucón hotel, and all mountain and safety equipment included, all you have to worry about is getting to the top, around 4,600 feet (1,400 meters) above sea level. The reward is a spectacular view from the summit, of a surrounding landscape that includes eight volcanoes and six lakes. We recommend you to wear the first layer, polar or polero as second layer, windbreaker jacket as third layer, closed and high trekking shoes, long socks, hat, gloves, sunscreen, sunglasses, water and food for the march. The arrival at the summit will be subject to the physical conditions of the participants and the weather conditions of the place.